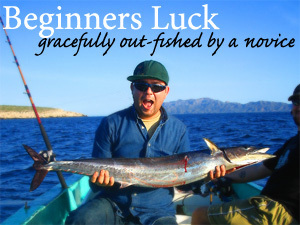 Beginner's Luck, Gracefully Out-Fished by a Novice | FISHING FURY - A Fishing Blog with Attitude! 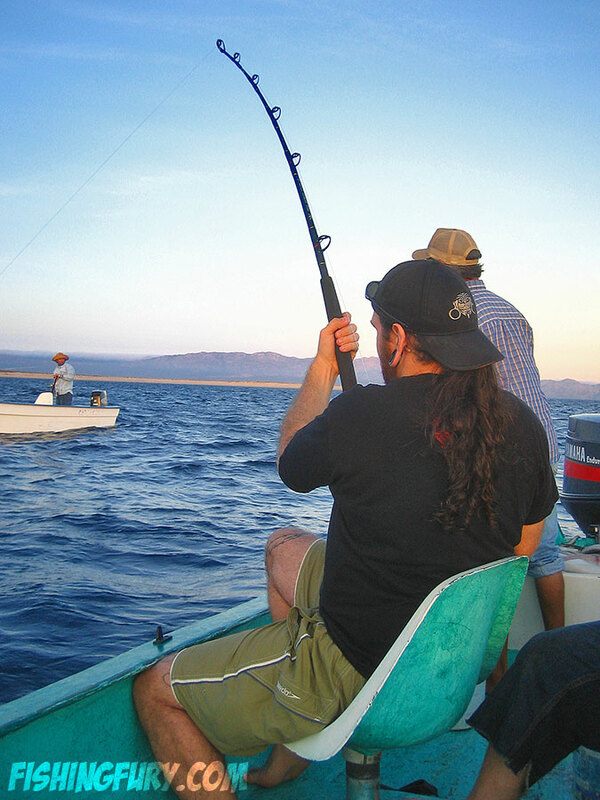 It’s been difficult finding fishing partners in La Paz since Clive left for the British Virgin Islands. I’ve some found people willing to go, but not after they find out we leave Fishermen’s Fleet at 5am. There’s not many people interested in waking up hours before the sun in the land of cheap cerveza, but I managed to convince Mike Brum and Philip Barbosa. Promising them an unforgettable experience before they went to bed, I set the alarm for 4AM. I made sure to find out how much time they needed to get ready since I’m generally awake and out the door in 5 minutes for any situation. To my surprise everyone was sticking to the plan. I thought for sure I would lose at least one of them since there are only two chairs in the panga boat, but they were both awake and ready in no time. We arrived at Fishermen’s Fleet and headed upstairs for some coffee and breakfast. I couldn’t believe my eyes when I saw how many people were waiting. It would take four huge vans to shuttle us to La Ventana. By some strange occurrence of beginner’s luck and being dubbed “the new guys”, Phil, who has never actually caught a fish in his life, was our lucky charm. When we arrived the sun was just starting to show over the mountains to the east. We met our captain, loaded the boat and embarked on our adventure. Heading out from the shore instead of the normal grouping of panga boats selling sardinas for bait, we drove around the point and the captain tied on squid jigs. I’ve seen these in the stores around town, but it wasn’t until now that I could say I’ve used one, let alone caught a squid on one. Basically, it’s a large weighted plastic body with an array of hooks or barbs all the way around the bottom. You drop the bait to the bottom, pull up hard, and let it fall. It’s a simple tactic, but you have to know where the squid are, and luckily for us our captain has fished these waters for nearly 40 years. We caught two squid of about four or five feet in length, including tentacles. I decided to pass off the rod the next time I hooked into a squid, providing a good lesson for my friends on how to hold the rod as well as the dynamics and tempo of fighting a sea creature. Squid don’t actually fight if I’m honest, it’s more like reeling in a bucket of water, but it was still a good learning experience. The captain made quick work of the squid once they were close to the boat. 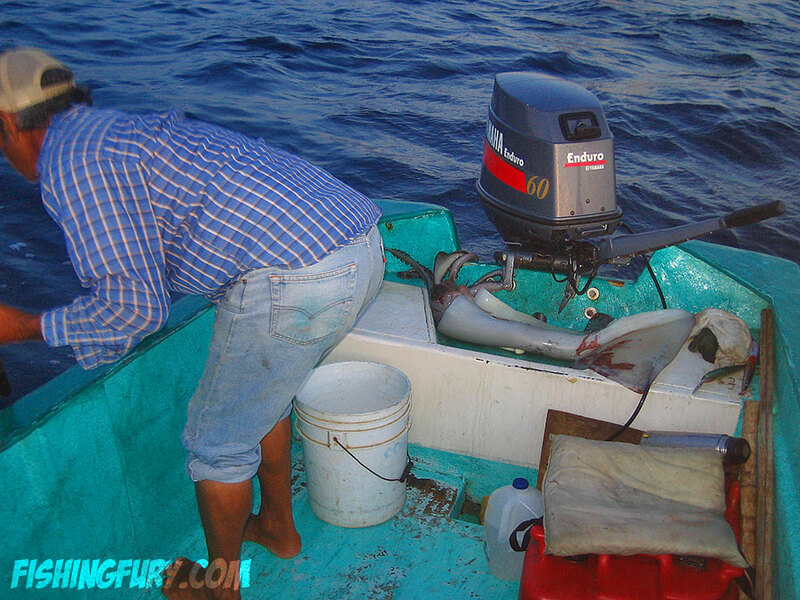 A strong hand on the gaffe and a few fast strokes with his knife and he could split the squid open, remove the pieces that wouldn’t be used for bait, and toss it onto the boat. Mike finally hooked into a squid and when it surfaced all you could see was a dark crimson red blob. As Mike pulled it closer to the boat I realized that it was a Humboldt Squid, , also known as the Diablo Rojo (Red Devil). They can be quite dangerous and have been known to attack scuba divers on occasion. I asked the captain if he knew what kind of squid it was and he confirmed my suspicion, while agreeing that it could be dangerous. He spent a little more time stabbing this one than the previous, making sure it was dead before he got his hands too close. Looking around at the other boats I could see other people fighting squid, even a local fisherman in a boat by himself catching these monsters with just a thick monofilament and his bare hands! 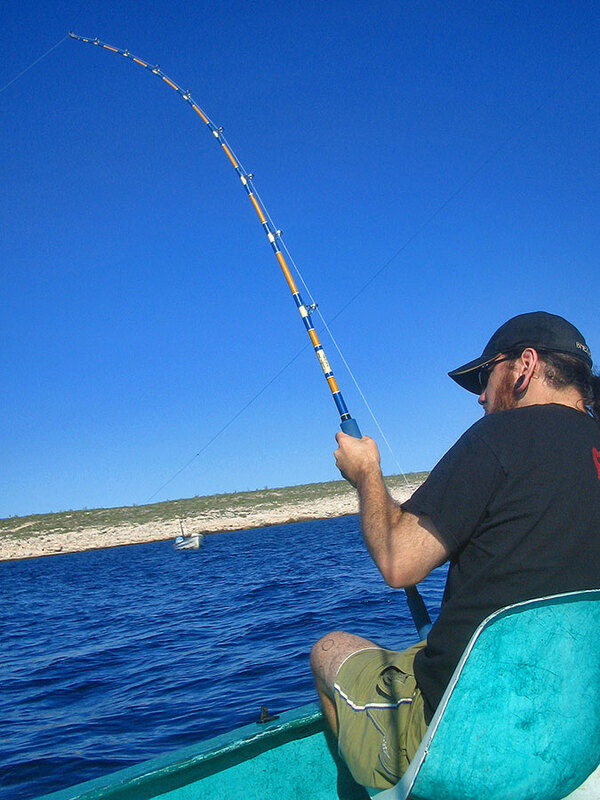 With the boat full of bait we headed up the coast trolling two big tentacles. A few hits here and there but nothing big enough to take the large pieces. 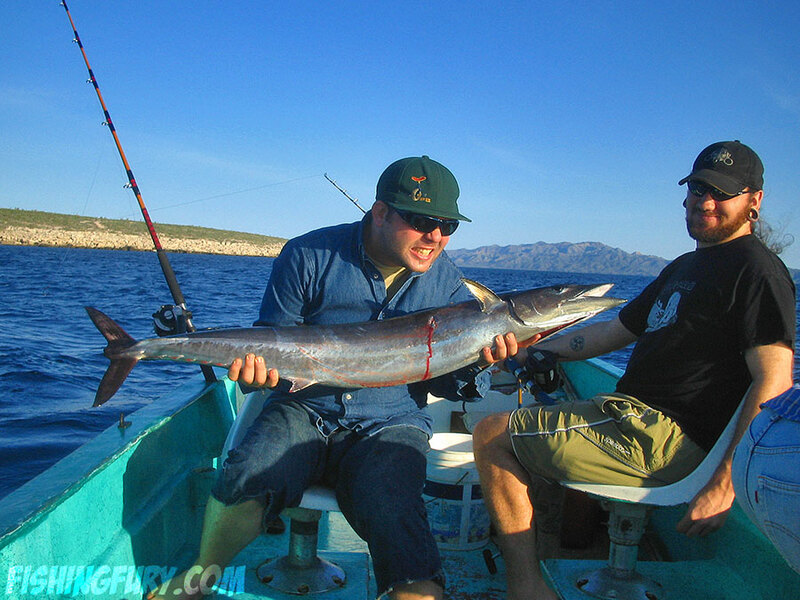 Suddenly both lines went off and the fight was on, but unfortunately, it was a couple of giant needlefish. Dazed after a few knocks on the head with the captain’s fish club and they were tossed back. 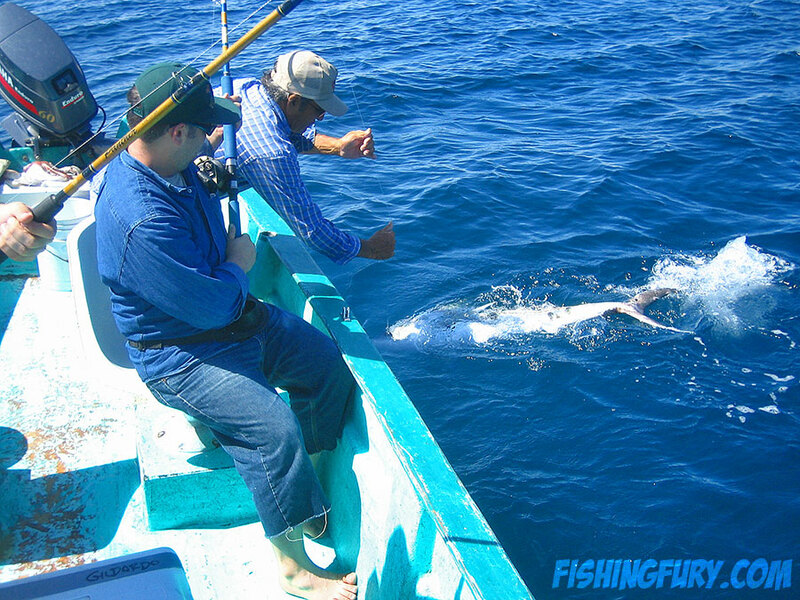 We continued trolling, stopping only for a moment for the captain to adjust some cargo, when Phil hooked the first fish of the day. It was a Wahoo, and a big one too! I stood up on the platform near the bow to get a better look, hoping to capture an awesome image of a dorado flying out of the water, but the fish never surfaced. It ran back and forth down the coast a few times. 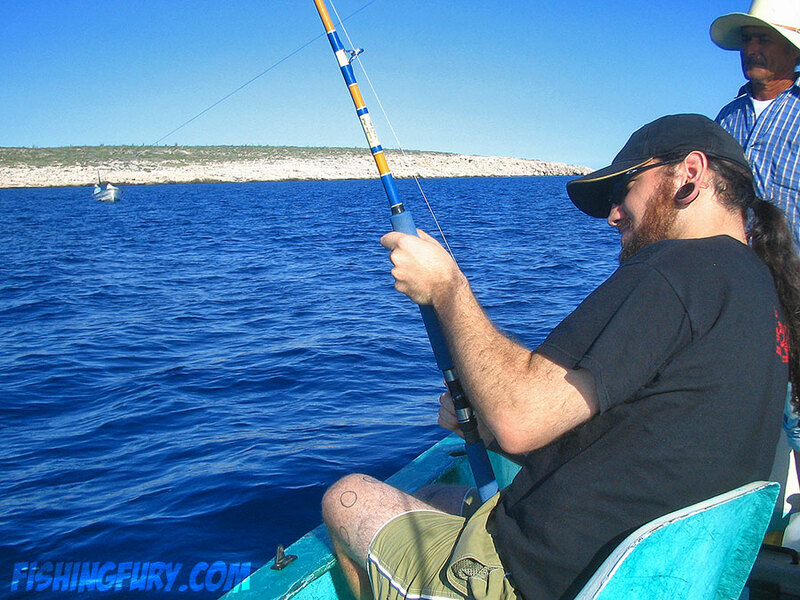 Phil was about ten minutes into the fight when the fish came close enough to identify. 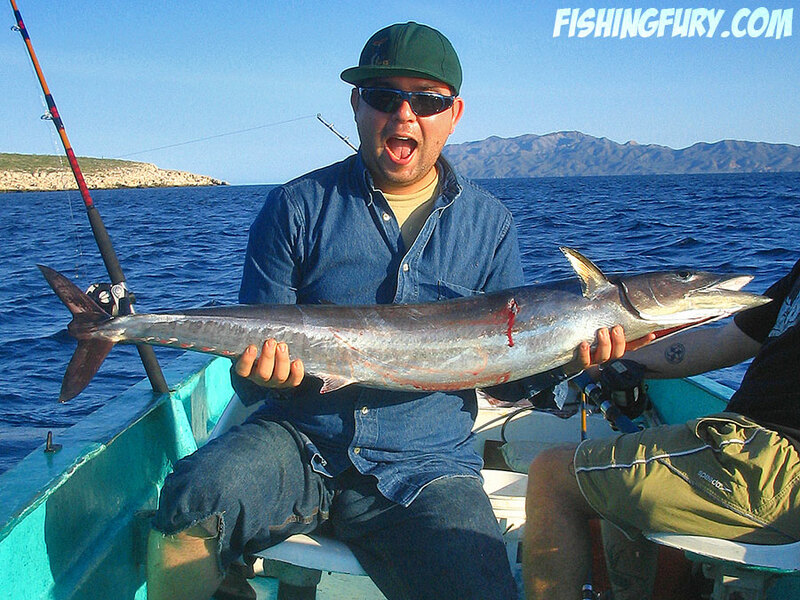 It was a wahoo, and a big one too! The captain quickly gaffed it and pulled it onboard for a few photos before stowing it away. 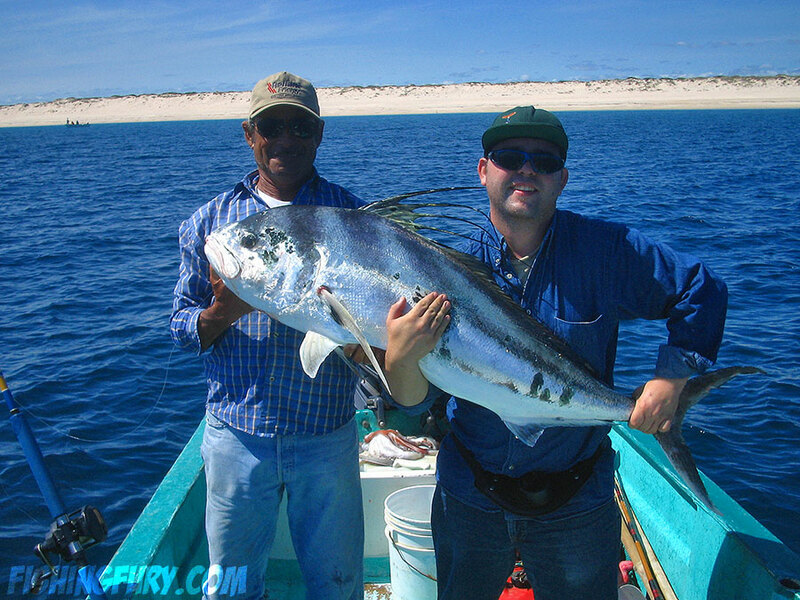 The captain explained that the wahoo and dorado commonly hang out around each other and that landing a wahoo without a wire leader is considered very good luck. He checked the line and showed us how the 40lb mono was extremely frayed but never lost integrity. The fury was definitely on our side, things could only get better from here. We continued to troll the same area looking for dorado. Phil’s arms were a little tired from his wahoo fight, so he offered to handle the camera for awhile and take pictures. Most people don’t realize the power these fish have, and just how much work fishing can be. Mike and I both caught a few more needlefish and the captain decided to change our position and tactic. We pulled out a little further from the shore. The captain cut up a few pieces of the squid and tossed them out with our baits. 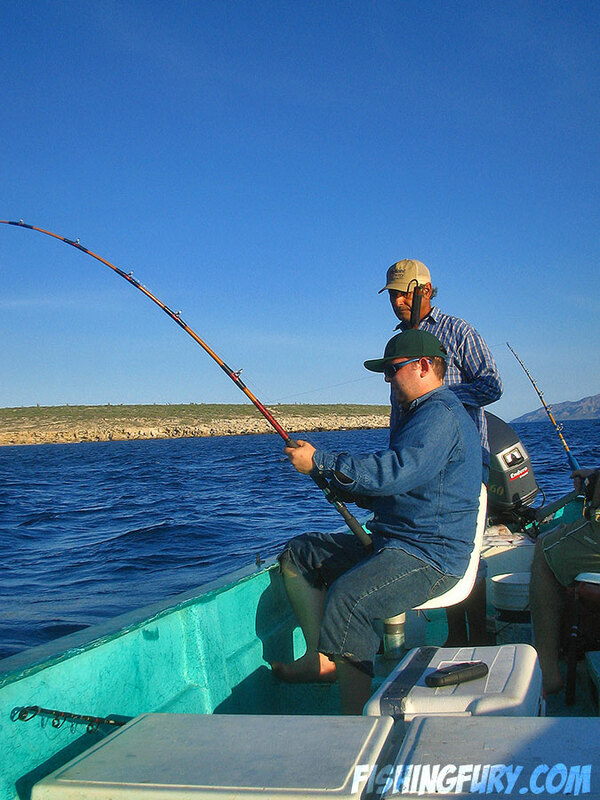 We pulled out a ton of line so when we drifted away we wouldn’t pull the bait out of the group. The big white chunks of squid slowly sank as we drifted away, waiting for them to be devoured by tuna. The big white chunks of squid slowly sank as we drifted away, waiting for them to be devoured by tuna. With so much slack in the line, even after drifting away, we could actually watch the slack line being pulled out by the tuna. Once you see the line moving faster than the drift you set the drag and hold on tight. It only takes a split second before all hell breaks loose. 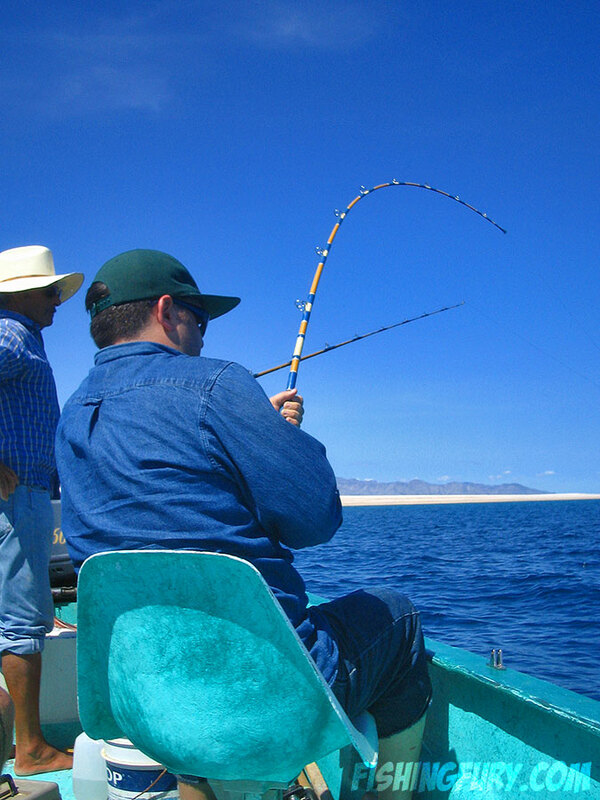 Of all the fish I’ve caught here in La Paz, Pargo (Snappers) have been the strongest. 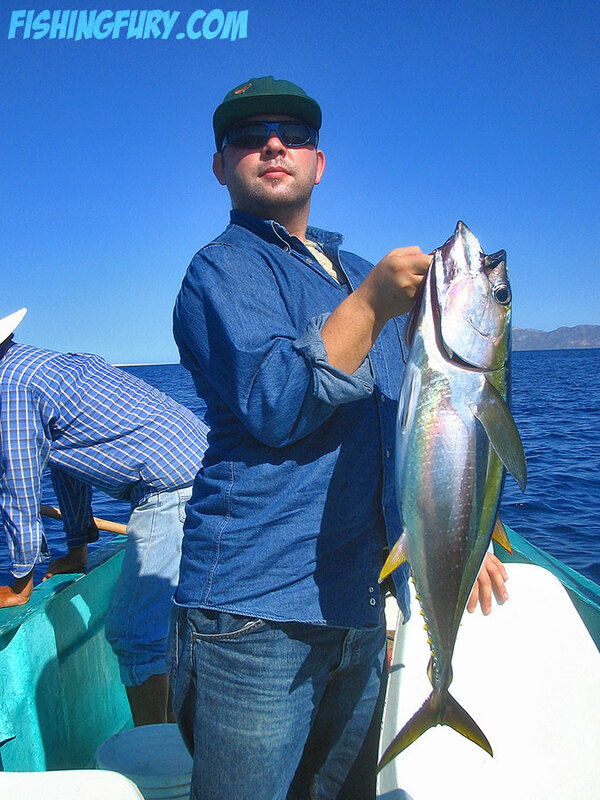 However, Pargo and even the big Amberjack have nowhere near the power of the Yellowfin Tuna. It could easily take over 15 minutes to bring a tuna within reach of the gaff. 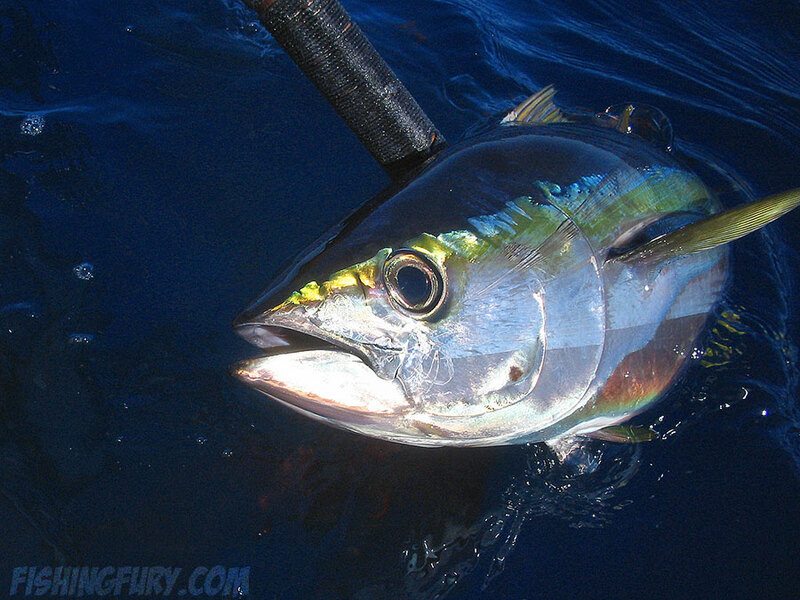 Once gaffed, the tuna would go completely insane, splashing just about everyone in the boat and almost ripping the gaffe from the captain’s arms. For every tuna we caught, someone got a face full of water and though it was mostly our captain he seemed to agree that it was still very amusing. 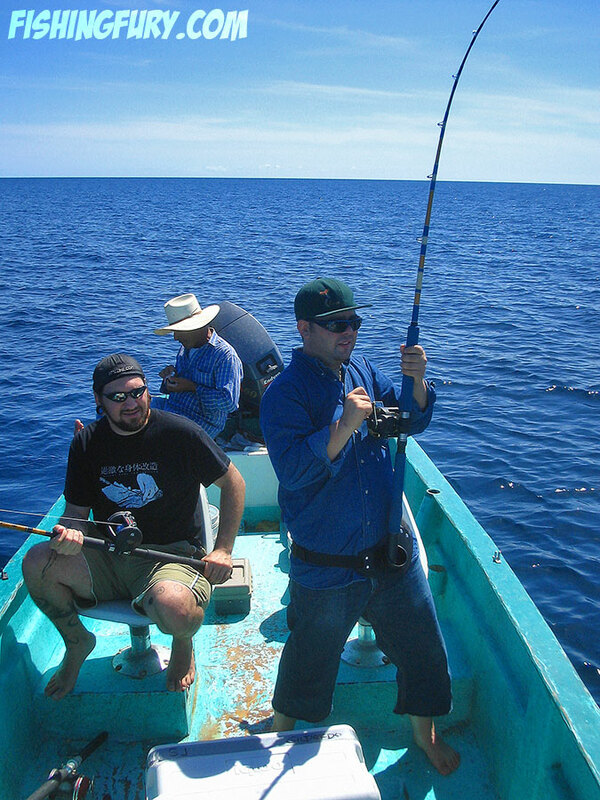 After a photo with my first yellowfin tuna I decided to give Phil back the rod and have Mike sit next to the captain. 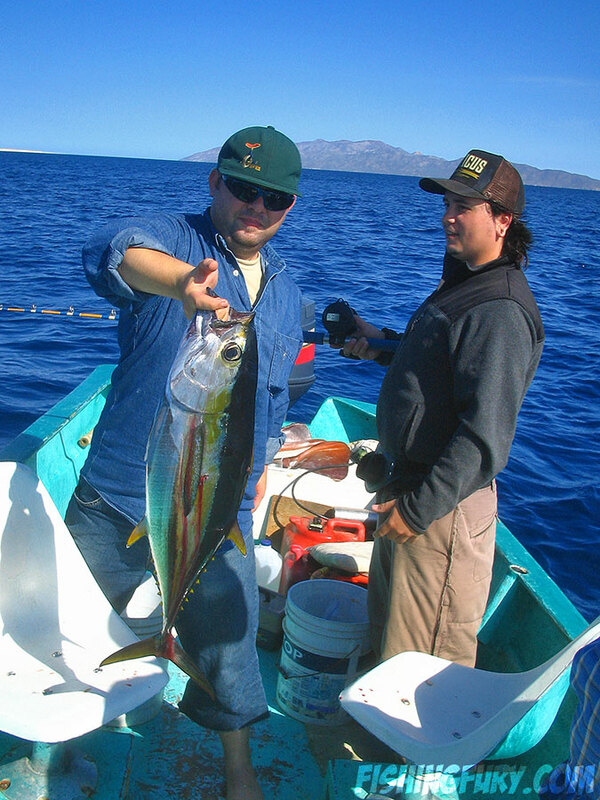 Sure enough, it only took a few minutes before our captain had Mike hooked into a tuna and after a quick photo we pulled back to the same spot to drop the bait and drift away. 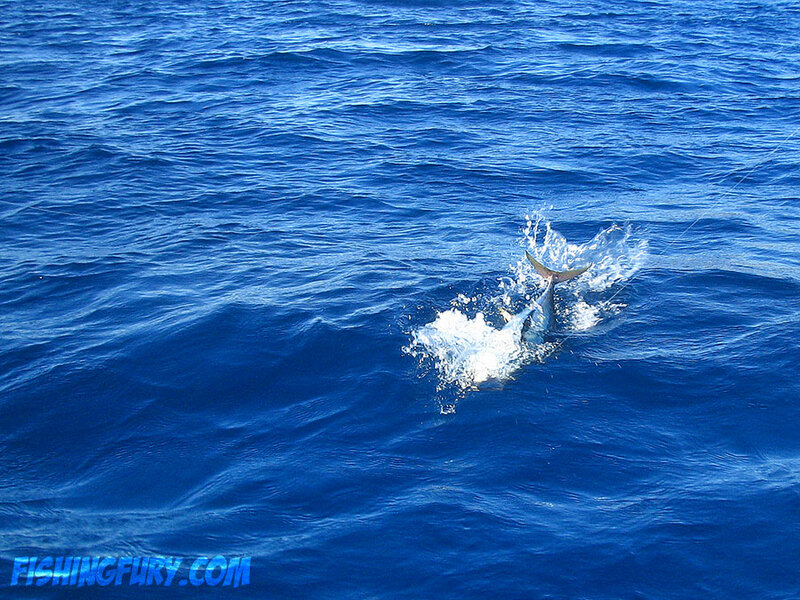 It was almost like clockwork, after a few minutes or so of drifting and the bait slowly falling, it was tuna time. One after another, we pulled in tuna after tuna. 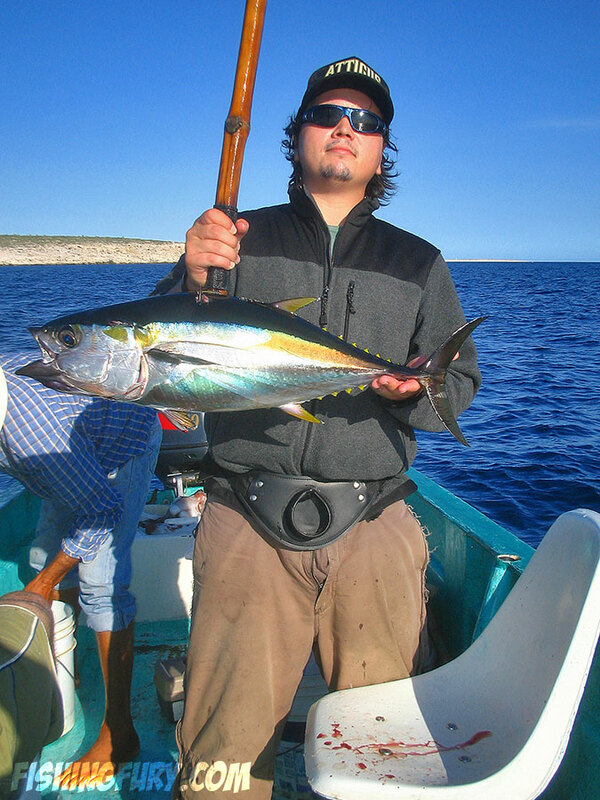 After catching 5 tuna in total, we realized that we were probably sitting on top of a huge school. 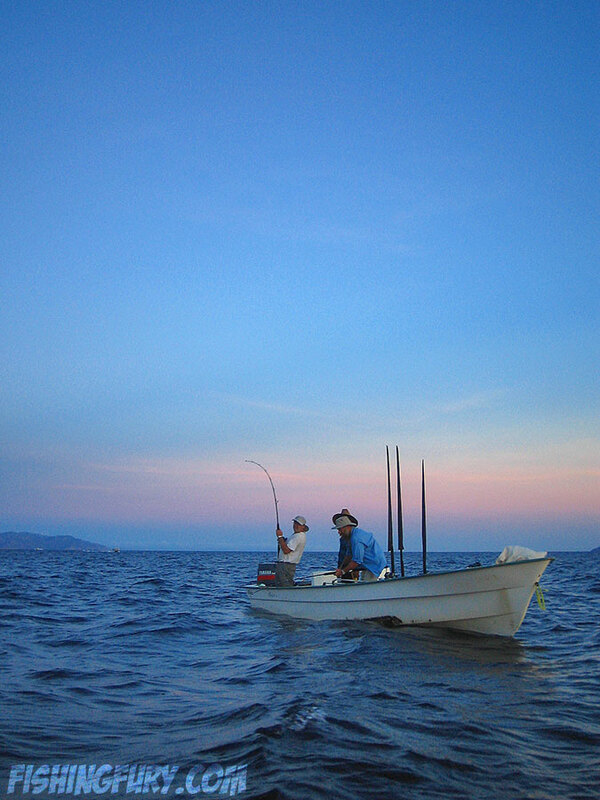 It was decided that we would try for one more tuna and then move to targeting Roosterfish. 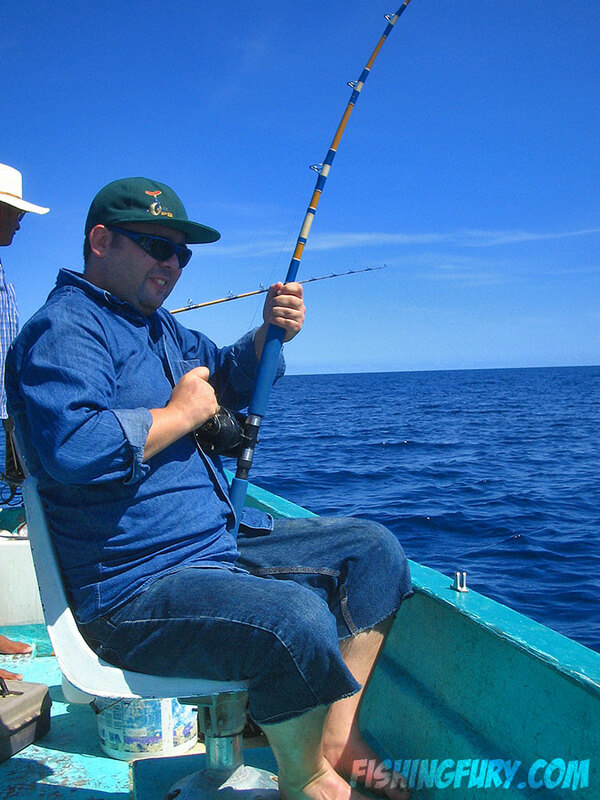 After 10 minutes or so, with no more tuna in sight, we pulled in our lines and drove off to catch bait for big roosters. We travelled back to the point at the end of the beach, not far from where the vans pick us up, and our captain asked another boat if they had caught any Ladyfish for bait. The captain of the other boat tossed us one ladyfish and wished us good luck. Our captain pulled out a small block of wood with a bunch of monofilament wrapped around it, tied a hook to the end of the line, and put on the smallest piece of squid you’ve ever seen. He spun the hook and bait around over his head and launched it about ten feet out. It took a few tries, but we found the bait we were looking for surrounded by a school of needlefish. The needlefish were the most amazing colors under the water. When you pull them out they just look black and silver, but under the water you could see deep purples and blues. A few even appeared to have bright yellow portions on their nose and tails. Our captain caught five bait fish in total, I’m not sure what kind. I was more amazed he could pull anything out of the water without hooking into a single needlefish. He looked like a real fisherman bursting with excitement at the sound of the drag. It was quickly approaching the hottest part of the day and we weren’t sure if we could find a roosterfish before it got too hot. We toughed it out, trolling around for almost half an hour before Phil had something. 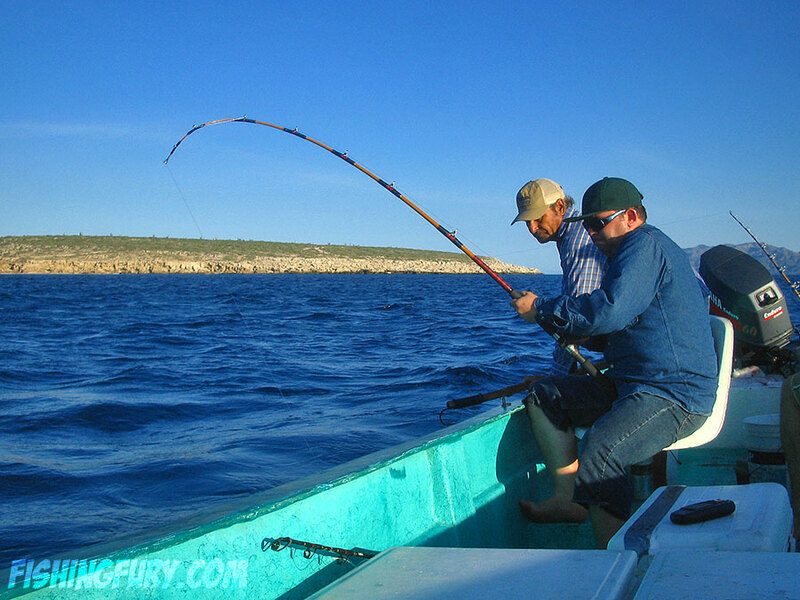 The reel screamed as he patiently waited for the fish to swallow the bait before flipping the drag and setting the hook. He looked like a real fisherman bursting with excitement at the sound of the drag. It took another half an hour just to bring the fish close enough to see. Without any polarized glasses Phil couldn’t see below the surface, so when I saw the size of the fish I just kept telling him to relax. “It’s just a little one,” I said. Of course I knew full well just how big this fish was. Even Mike was able to see it thanks to his glasses and looked over at me with his eyes wide open, pointing and mouthing “Is that it?” I just nodded and laughed. After almost an hour the roosterfish was tired enough that we could bring him in. Our captain reached down and pulled the roosterfish up, posed for a quick photograph with Phil and put it in the water to be released. He held on to the fish for awhile, but was unable to release it without it immediately going belly up. We tried massaging, and even knocking its air bladder so that it could at least rest on bottom. After 15 minutes we realized it wasn’t going to swim away from this fight, so we brought it in and gave it to the captain for him and his family to eat. Back at the beach we hopped out of the boat and I immediately started looking for the weekend warrior. Unfortunately, he wasn’t in yet so we started pulling out our catch and laying them in the shadow of the boat so they wouldn’t cook in the sun. We walked around a bit to see what other people had caught. 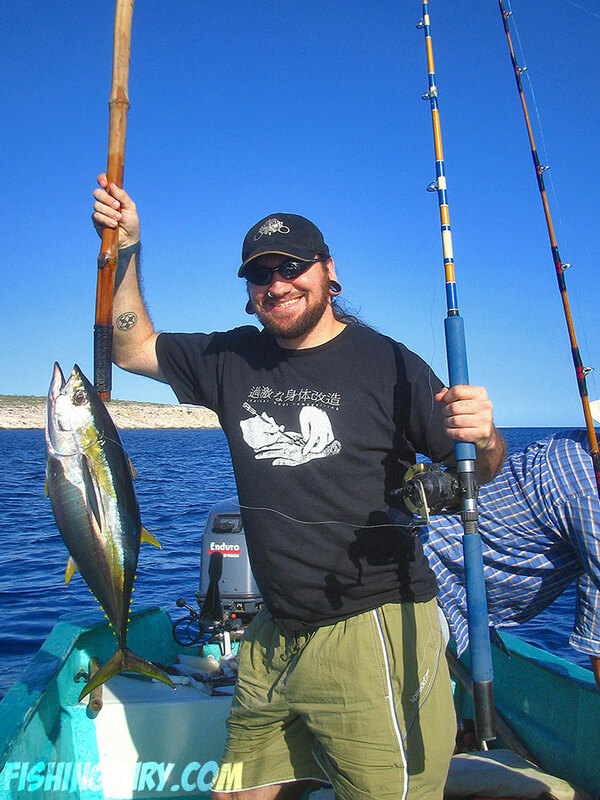 Everyone had a few tuna, but no other wahoo or roosterfish were brought in. 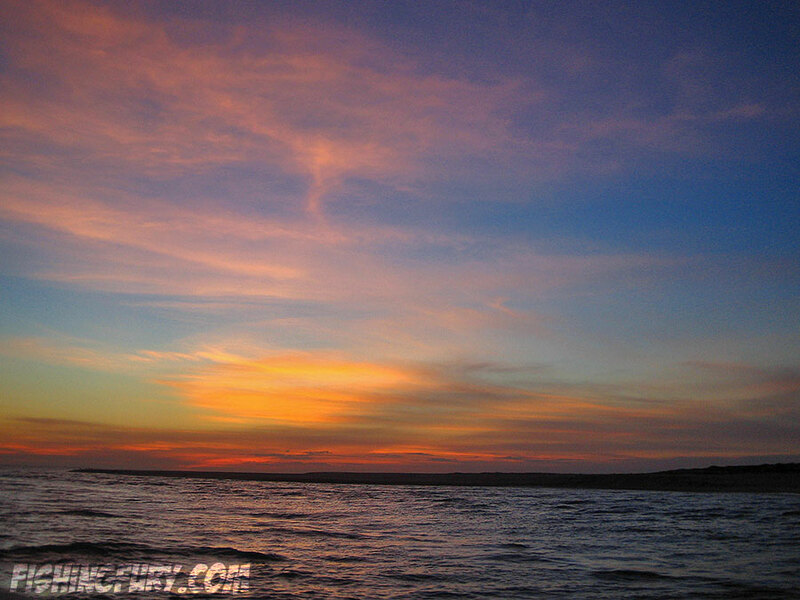 So far it was looking good as we had out fished everyone on the trip, all that was left to do was wait for the weekend warrior. 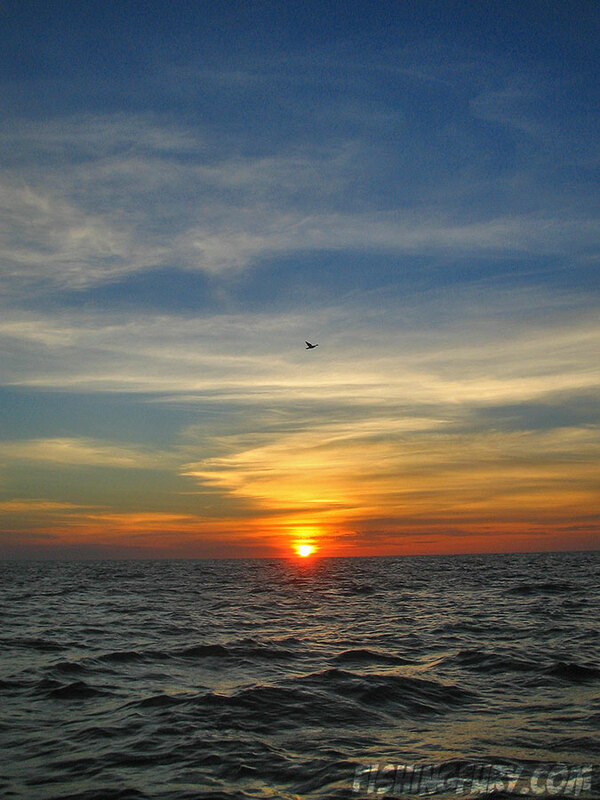 After a few beers and hearing some tales of fish lost by the other fishermen on the trip, we saw the last boat coming in. Sure enough it was him. His boat crashed the shore right next to ours and when I looked over he had a big smile on his face. His eyes widened and his face lit up when he saw the stockpile of fish and huge rooster. There were of course no hard feelings, we shook hands and shared the stories on the ride home.